Professor Heller seeks to bridge the gap between the mythologized and sentimentalized past and…actual experience of Polish Jewish life. 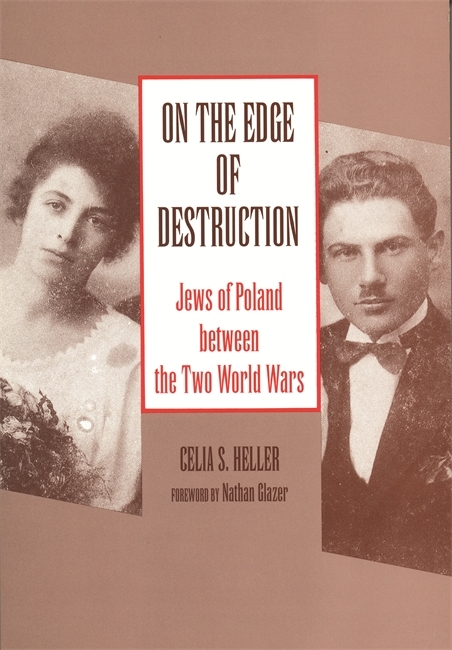 On the Edge of Destruction, focusing on the Jews of Poland between the two World Wars, illuminates a critical time in the recent Jewish past that has received surprisingly little attention. The Holocaust virtually destroyed the Jews of Poland, once a community of more than three million, constituting ten percent of the population, and the oldest continuous Jewish community in a European country. This book looks at the rich and complex nature of that community and the tremendous pressures under which it lived before the tragic end. The first half of the book deals with the objective situation of Poland's Jews and the complex historical development of the community. In Part II, the focus is almost exclusively on the actions and the reactions of the Jews to their situation as a despised and oppressed minority. A new epilogue to the second edition brings the complex and tragic story of the post-war Jewish remnant in Poland both under communism and democratization. Celia S. Heller is Professor Emeritus of Sociology at Hunter College and the Graduate Center of CUNY. She earned her Ph.D. at Columbia University. Wherever possible, we read the words of individuals; they speak out in diaries and letters, newspapers, through the pictures, often snapshots, of their lives between 1918 and 1939. Professor Heller seeks to bridge the gap between the mythologized and sentimentalized past and . . . actual experience of Polish Jewish life.